There is a lot of data online at the Maryland Archives, but it is not always easy to find. Even when you get to it, it is hard to see what is there, since it only seems to provide a search function which allows you to find something if you already know exactly what it is called. The following are direct links into specific parts of the Maryland Archives website. as well as a few into Ancestry.com and FamilySearch.org. Help is needed to locate some electronic records at the Archives that are supposed to be available, but are not. While I continue to search for these and enquire at the Archives, if anyone has information on how to find them, I would appreciate suggestions. Note: The Helper buttons below use pop-up windows. If you do not see them, you must tell your browser to accept pop-ups for this site. Original certificates available on paper at T1886 (1898-1913). S-Z on scanned microfilm, I-R needs to be scanned. Go to Archives to view originals (up to 1913). Up to 1924 available with proof of death. Maryland Marriage References - Barnes 1623-1820 S1527 Index 123 - alphabetical listing from various sources. Hint: Always check the land records. Sometimes there is a "pre-nup" recorded, especially when a widow with extensive property is getting married. Marriage index 1777-1799 - This is taken from CM174 below. Online copy (requires login @ Family Search), but result is hard to use. Local archived copy (1 PDF file, 7.6MB) for simple use. Second archived index (1 PDF file, 60 MB) easiest to use. See 1777-1799 from FamilySeach above for alphabetical index. marriage register 1865-1987+ CM176 Scanned up to 2002, but must go to Archives to view. MD Marriage index - Female 1914-1930 SM184 All scanned. It appears that it is intended to be available online, but there is an error. Go to Archives for Microfilm. Grouped by county. They can be found by "serial number" which is what is found in the indexes CM223-226 and S1851. Not online Whole state, see SE58 and SM25. Death index (counties) 1898-1951 SM25 Whole state, 121 PDF files, 50-200 MB each, same as in SE58 and SE8. Note: The actual death certificates are at SE42 (1898-1910), SE43 (1910-1951), SE44 (1951-1969), SE45 (1969-1972), and SE46 (1973-2001). Although links are shown, the data is restricted. To view the entries for one county within each of these lists, use the "filter" at the top. You have to go to the Archives to view the actual death records. CM1132 for 1874-June 1950 (microfilm, all scanned). Use this Electronic search by name to find date and certificate number. Note that the microfilm number given is not where the original is located. Use CM1132 to determine the microfilm number, which can be viewed at the Archives. City/County death index 1972-2001 n/a In 1972, the city and state recording was combined. Although the certificates themselves are available at the Archives, the index is not. Ask at the Reference desk, as some staffers have access to the Division of Vital Records index. However, if you know the death date, you should be able to find it without an index. The list of records is at SE46 (at Archives only). Colonial probate records index 1634-1777 SE4 26 files, 330 MB total. This is mostly an index into the files contained in the next entry. Colonial wills 1635-1777 S538 60 files, 5.13 GB total. Note: copies also available in the next item. Colonial wills, accounts, etc. 1635-1777 TE1 Huntington Collection - 256 microfilms taken in 1946. Contains court judgments, wills, balance books, inventories, accounts, inventories, testamentary, BA and AA County deeds, Black, Red, Brown, Blue Books, and index to wills, inventories, account, etc. Note that some wills are recorded both here and in Baltimore County. See chart in AOL, Volume 415.
vol. 8 - Wills 1738-1743 (Liber 22-23). See next item for wills for 1675-1852, Books 1-24. Also check above under "Colonial Wills", since some are also recorded there. Also check land records - some wills are recorded there. 1666-1979 CM188 Microfilm, all scanned, go to Archives to view. Hopefully, these will be online soon! See above item for part. 1852-1940 Index (1922-1941) Files with all supporting documents, can be found at two locations at FamilySearch.org (free login required). This link is a combined index. Index (names) 1713-1853 S1432 Index 60 - 1 file (3MB), also called SSF512. This has 12,422 entries. Tract index 1713-1853 S1433 (Supposed to be) Index 61 - This link is wrong and leads to the same file as S1432. But, since it is basically a text file, it can be searched for tract name. (12,226 items) 1760-1853 S512 Essentially same as S1432 above. Divorces, foreclosures, estates, etc. Only the list of descriptions is online (except for 5 of the 12,226 which have files online), but description lists all the names. Mostly alphabetical by 1st listed name, but not completely. Use filter on description to reduce display to a name of interest. Sorts by date, description, and citation do not work correctly! (4,443 items) 1815-1851 C295 Divorces, foreclosures, estates, etc. The files are viewable under CM146 (at the Archives). 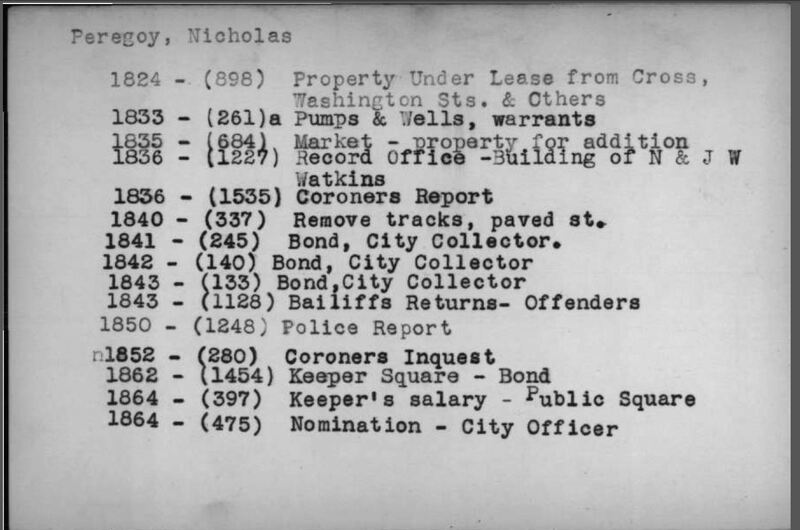 Equity Docket index (City) 1853-1982 CM1295 37 PDF files, one for each group of names, ~150 MB each. Circuit Court #2 1888-1982 CM1296 40 PDF files, one for each group of names and time period, ~50 MB each. Passenger arrival index (Baltimore) 1833-1866 BRG55-4 71 PDF files, about 150-250MB each, total 12 GB. The manifests are at MSA T-2821, (but with no data available online). There appears to be microfilm - a list can be found at BRG55-1, but these are not available at the Archives under these numbers. The originals are presumably located at the City Archives. A "browse" function. These cards look similar to the cards in BRG55-4 above, but sometimes have different data. Go to Archives for microfilm at CM1306 for records. Naturalization, index (City) 1867-1906 CM1318 1 file - gives name, year, place of origin, and book/page of record (Books 1-22, 1867-1906). A-Z. Actually, very few after 1899. CM1315 for Books 1 (1867-1872), 4 1872-1879), 6 (1878-1881), 7 1881-1887), 10 (1887-1889), 12 (1889-1892) (scanned) and 17 (1892-1895), 19 (1895-1900), 20 (1899-1903), and 26 (1903-1906) (not scanned). CM1317 for Books 2 (1867-1876), 3 (1876-1886), 9 (1886-1889), 14 (1889-1891), 15 (1892-1894), 18 (1894-1900) (scanned) and 22 (1899-1903), and 25 (1903-1904) (not scanned). CM1320 for 1851-1900, Books 11 (1851-1854), 5 (1854-1857), 15 (1857-1884), and 12 (1884-1900) (scanned). 1912, 1913 n/a You must first be logged onto Ancestry. Better yet, find a single PDF file here. (City) The Archives system for this is very hard to use. (Link in far left column.) It brings up 1124 "thumbnails" that totals more than 400 MB. So use this only if you have a very fast interface or have a lot of time to kill. Otherwise, use this display tool to display one page at a time. The County begins at image 928. Baltimore City Wards 1797-present n/a This link provides great, interactive maps showing the Wards of the City during various periods. Huntington Collection 1735-1900 TE1 Collection of 256 rolls of MF made in 1945-1946. It contains a variety of items. While portions are included under the appropriate subjects in this "Helper", here is a full list. Settlers index 1634-1680 S1503 Index 117 - Provides search by name, reference, etc. Rootsweb info for Balitmore County and Baltimore City.